Mehida hails from Finland and despite this album being their debut release, the band members have been boiled in the kettles of the music industry for much longer. As far as note-worthy name-dropping goes, keyboardist Mikko Harkin served a period behind the Roland in Sonata Arctica and vocalist Thomas Vikström has served some time with doom-maestros Candlemass. I gotta say right off the bat that Vikström has some mighty pipes behind him. He doesn’t possess an unearthly range with glass-shattering wails or murky growls, but damn, does he pull the classic metal voice, slightly in the Geoff Tate-corner of shades, with ease. A definite asset for the band. The band seems tight throughout the challenging pieces of music on display throughout and even though this album has seemingly been originated as a self-financed project, the production is very good. The music sticks to a slightly priggish mix of metal and rocking elements, with some programming and futuristic keyboard-sounds thrown in for diversity. Some of the tempo-jabs with the guitar riffs and drums (check out the first chugs for Unchanging) have a definite early-90s Dream Theater -flavour. Soft and slightly crushing heavy moments are mixed quite seamlessly. Song-wise, the bunch takes off properly with a semi-ballad, as surprising as it is to say that. Burning Earth starts off with a furious drum-blast but then slows down for a grabbing mid-tempo power ballad. Although the promo sheet cannot confirm it, my ears have been molten shut by too much Nile if that isn’t Diablo’s Rainer Nygård performing great intro grunts on Multitude, a very punchy, heavy track. Dry Bones gives the big picture a nice injection of speed, which I would have liked to have more. 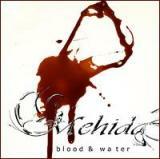 For as it stands, Blood & Water is at its best when it throws itself into the depths of slightly mellower, moody songs. A good eaxample is Stronghold, not just unwitting tribute for indy-tastic wrestler Roderick Strong’s finishing maneuver, but a damn good track as well. I’d still say my favourite off the album is Grace, a rocking tune with a catchy-as-hell -chorus. Although the honey-glazed harmony vocals are very well done throughout, they shine best on this tune. Not all the songs are up to par with the hookyness of the tunes I mentioned, which keeps this album from reaching a scale of outstanding. Overall, anyone enjoying good slices of rocking metal (or metallized rock, take your pick) with proggy quirks thrown in with good measure, Mehida is a very worthy acquaintance. The group is still digging for a good niche of their own along with a more personal sound but as far as technical accomplishments booted with some good tunes go, they are on a great path forward.